Afghanistan men clothing is mix of all different types of colors and designs including Afghan traditional men's clothing and western styles. The majority of Afghanistan men clothing is the typical dress 'perahan tunban' which is approximately 70% and can be worn as normal inside home and out going fitting. The rest 30 % of men are wearing western style clothing such as jeans with shirts, pants, suites etc. The western style clothing is mostly common in the capital Kabul and other main cities of the country. Government men employees are wearing suits as well as fabric pants and shits with tie or without as formal work uniform. Jeans and T-shirts as well as perahan tunban with a coat or waistcoat on top can be worn too in some places as formal work clothing in Afghanistan. The typical dress perahan tunban can be worn in southern provinces as formal government employees uniform. Wearing western style clothing such as jeans and suits can be dangerous in some part of the country and people might be starring at you differently like you have stolen something or you have killed somebody, so it’s always good to dress up similar to those particular areas. The other Afghan mens clothing is the head covering such as turban and hat. The turban is made out of a proximately four to eight yards silk, cotton and other fabrics which can be really long in length and comes in several different colors with stripes. As the fact of Afghanistan men clothing, every province has its own costume of clothing including different styles and colors and in some parts of the country people can be recognized by the color and style of their clothing. Some of people Gardez province and Kuchi people can be recognized by the style and color of their turban. They usually wear noticeable and colorful turbans such as, dark blue with black stripes, yellow and some times dark green and a few other colors. The main used colors for Afghan turban in Kabul and other major cities are white, white with black stripes, and gray which can be worn by older men. In southern provinces of Afghanistan where the Taliban are still exists, men are wearing a type of wrinkly cotton turbans which come in plain black and white colors. The cotton turban and long below knee cap length ‘perhan tunban’ was common during the Taliban regime and it was considered as part of their formal clothing. People are wearing the turban on top of a regular hat, basically first placing the cap on the head and then wrapping the turban around the cap but the wearer tries to have a solid thick cap so the turban can stay tight around the cap and it is really import otherwise the turban doesn’t stay solid. before they wrap the turban around the cap, they usually leave one side of the turban free as a hanging piece which the length can be measured about one yard and then they wrap around the extra part around the cap. Hat is an other Afghanistan men clothing or head covering which has different names, colors and designs such as regular hat (cap), Qarakul hat and Pakool hat. There are several types of regular caps but they are mostly made of cotton in large and medium sizes and can be find in black, white, gray and a few more colors. Qarakul hat which is made of lambskin is really nice and expensive although you can find cheap quality Qarakul hat as well but nicer quality is expensive. Qarakul hats are made in Afghanistan by Afghans and it’s known for a long time in the region and it can be considered as part of Afghanistan men clothing. 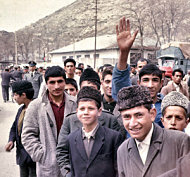 People including the school students were used to wear the Qarakul hat in 1960s in Kabul and it was more common among the Afghan people. There were several shops expert in Qarakul hats making in a famous place in Kabul called (Jadai Maiwand and Sarajji) as well as the trade of lambskin was really in demand. When the war and conflict started in early 80s, the business of lambskin and Qarakul hats dropped down badly and over a period of time gradually the other kind of clothing fell the space of Qarakul products. The third type of men's head covering is Pakool which takes place in third position and can be more common in one of northern provinces called Panjshir (5 lions). Pakool is made out of woolly fabric in the exterior and from a piece of cotton layer in the interior and it was known in late 80s in the region and represents as symbol of Mujahideen (The freedom fighters who fought against the soviets). The style of the hat is round and about forty centimeter deep which can be rolled up from the bottom. It can be really hot during the summer due to its woolly material but in the winters it's really warm and nice. People are wearing the Pakool hat with perahan tunban and a waistcoat on top as well as a cotton scarf around the neck. Wearing the pakool hat with suit is uncommon or can be found rarely. Some people like to wear or put a cotton scarf on top of their shoulder or around the neck as old fashion but it's because that all people are Muslims in the region and they use the scarf as praying cloth as well as for protecting the sun in the summer. In the winter season people are wrapping a big woolen scarf known as (Patoo or Kaish) around their body due to cold and snowy weather of Afghanistan. 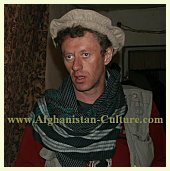 Now a day as seen in the news many foreigners and Europeans are interested in Afghanistan clothing and they like to try Afghanistan men clothing. The Pakool hat and the scarf are mostly seen with French people and they describe it as a nice men’s casual out fit. Discover more about Afghanistan men's clothing by typing your keyword in the search box above.